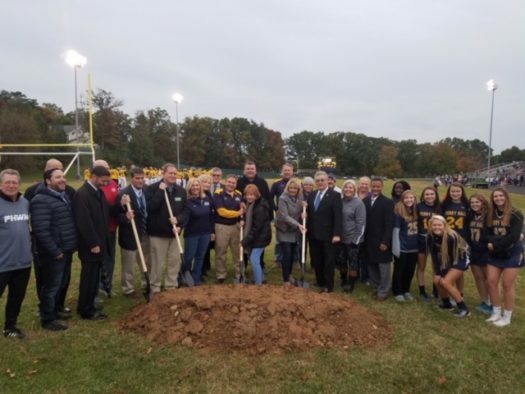 After many months of delay, on Friday, October 23, students, teachers, administrators, parents, and local dignitaries gathered at Perry Hall High School for a groundbreaking ceremony for the new turf field. Work is scheduled to begin in November. Many student athletes and parents were disappointed in the delay, as the field’s original installation was promised in summer of 2018. A significant amount of money was raised through community and family donations, along with a $250,000 approval by the Board of Public Works. “I feel like it should have been here earlier, but I’m excited to play on it,” said Kaleb Todjo, junior, who plays soccer. The groundbreaking ceremony took place before the senior football game. Members from the Booster’s Club, Alumni Association, and local politicians attended the event. Student athletes look forward to the artificial field, as it has many benefits and advantages including a flatter, smoother surface which allows athletes more control with running and handling. In addition, an artificial field is easier to maintain and more manageable to play on in bad weather, such as rain. Some conditions, like heat, can create less than ideal conditions on an artificial field, as blades of artificial grass tend to heat faster than soil. Freshman, Kylie Kurcoba, anticipates playing lacrosse in the spring on the new field. Alumni (Class of ’98) and Men’s Lacrosse Coach, Phil Rosseti, also looks forward to the use of the turf field. “The upgrade to a turf field here at PHHS will be extremely beneficial to our student athletes and our community. This will allow us to remain on campus to practice, as well as train and compete on a consistent basis. It has been great to see the community come together to make this happen. I am extremely proud to be a Gator,” said Coach Rosseti. Students, teachers, and community members all look forward too many seasons of turf play.